I don't know about you, but I'm happy to wrap up this dreary and rainy Monday. I'd much rather have snow on the ground instead of puddles, but wearing my cute new rain boots helps. Anyway....This Saturday, Jimmy and Andrew went on a little adventure out in the country in Papa's pick up to check out a Craig's list find for me. 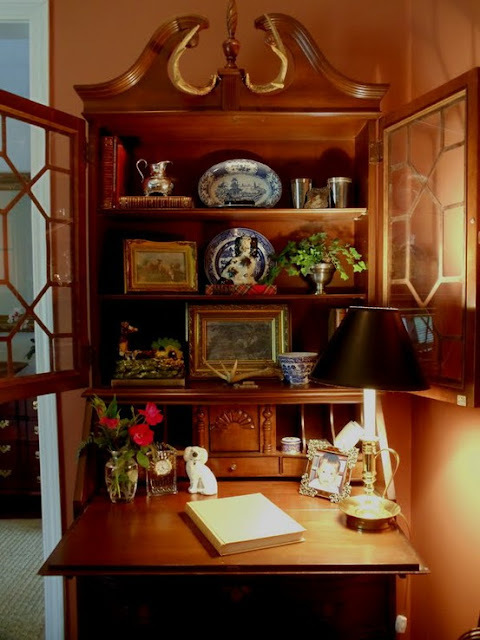 (ok, not really "the country", only a 45 minute drive away) I've had my hopes on finding a tall secretary to put in our upstairs office for some time now. I was kind of striking out. 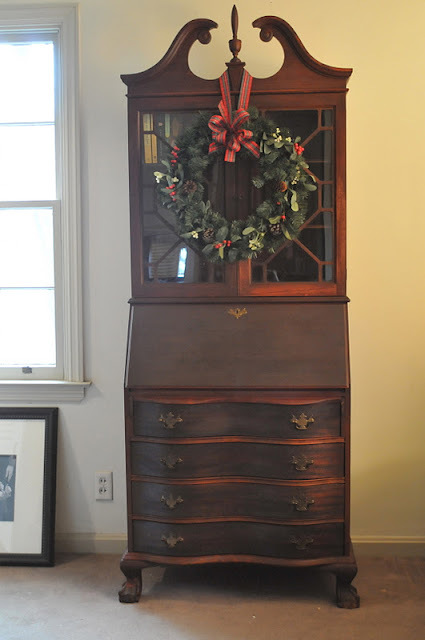 But on a whim I checked in last week on Craig's list and spotted a new listing for an antique Governor Winthrop secretary. I did a little research. 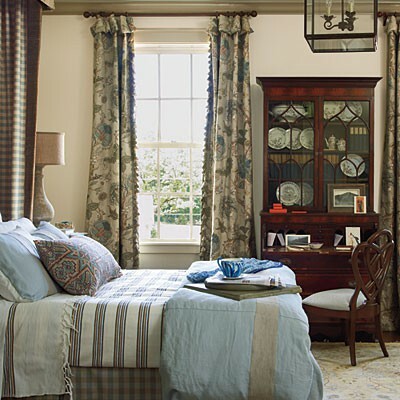 The style was created by Thomas Chippendale in the 1920's and named after the first Governor of the Massachusetts Bay Colony. Seems like they go for a pretty penny on ebay and at antique stores. When I saw the price I hopped on it with my pulse racing. I was sure someone would of snatched that baby up. Jimmy asked before he left if I was sure I hadn't missed a zero on the price. Nope. A rare steal. Hard to come by. It's in really good shape, just needs a little elbow grease and a couple coats of dark wax. You'll have to stay tuned to see what happens. For now I'm just thrilled to get the ikea bookcase eyesore outta there. 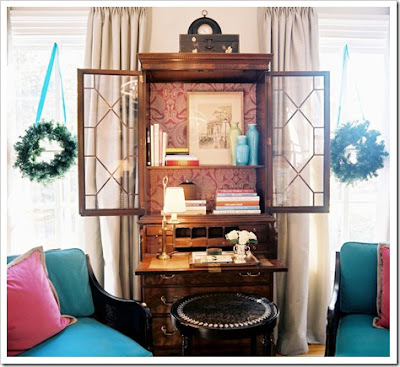 While we use this room as an office it is supposed to be a sitting room and adjoins to ours. this secretary is the view. 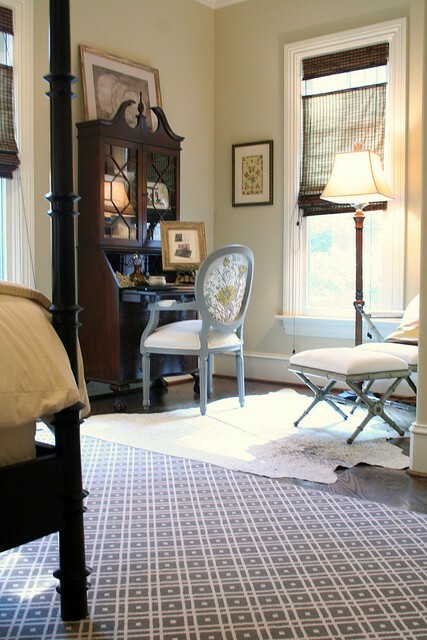 There is something so pretty about a secretary in a bedroom space, no? Now off for evening prayers + bedtime kiss for my eldest! By the way, I've been totally stalking your blog! Love your style!! It is gorgeous! I especially love the styling with the Christmas wreath on it. (Seriously!) My parents have an identical one that my dad uses daily for his desk in their living room. I will have to show all your pretty photos to my mom. What a lucky lady ... fabulous early Christmas gift! I'm thinking I like the color as is ~ can't wait to see what you decide. Looks like you all enjoyed a wonderful Thanksgiving. Love your skirt! How exciting! What a fabulous find!!! I like it as it is too. Classic and Classy. Tessa, it is just beautiful! What a wonderful find!!! Great find! I can't wait to see it in place; I know you will do a beautiful job finishing and styling such a handsome piece. Fantastic! I'm sure it's just perfect. love it! i agree with alex. don't paint it! your home seriously needs to be published! Ack! Don't paint it! It looks like it's either cherry wood or Mahogany. Mahogany is now a rare and super expensive wood. 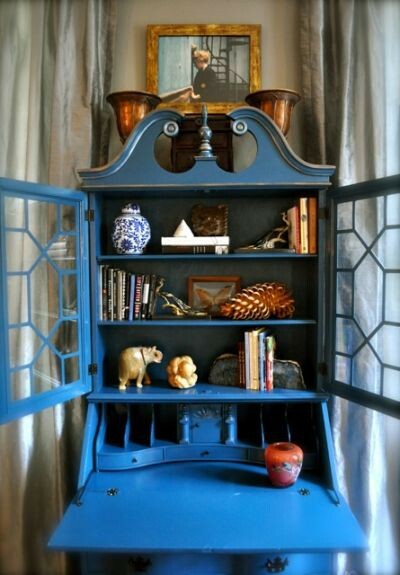 I loved painted furniture but only stuff that's not the best quality materials in the first place. Just kills me to see people destroy a quality antique with a coat of whatever colored paint. It's so warm and lovely the way it is. Woah! Guess I'm more opinionated on that than I thought! It will still be lovely if you paint it but you can't UNPAINT it, so take your time deciding. It's beautiful! Great find. Isn't Craigs List the best? What a beautiful find! Merry Christmas! I guess your heart was racing. Mine was just reading this post. I am thrilled for you! congratulations! I can't wait to see how it turns out. My in laws have one that looks identical to yours... I'm hoping it will be ours one day! Don't you love snagging something like that from Craigslist! 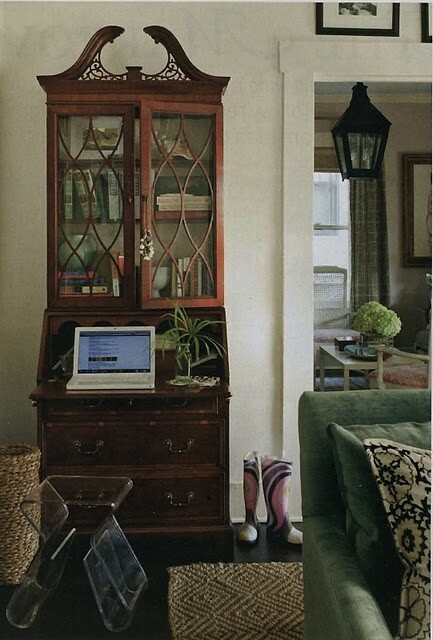 Hi Rachel ~ Yes, the first image is from the Southern Living Feb 2011. Love this piece! I have had a lingering thought for months now that a piece like this would work great in a certain spot in our home...so my search has just started to find one. Is it bad etiquette to ask how much you paid? I'm not really sure what is a "good deal" on a piece like this. LOVE the secretary......so glad you decided not to paint it...it'll look gorgeous in your beautiful home. I have always wanted an antique secretary like yours. Really pretty. Beautiful post dahhling...particularly loved the blue painted piece! 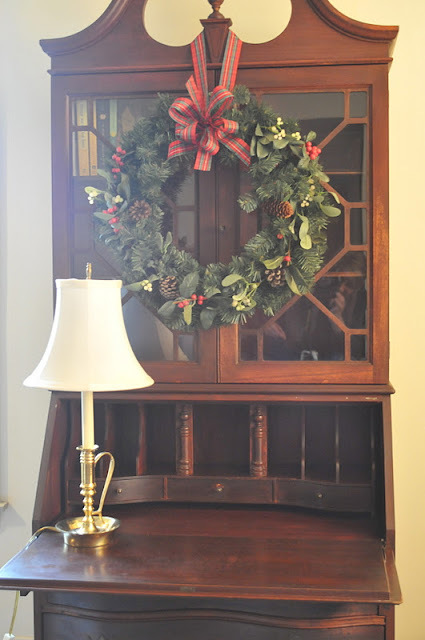 I bought this same secretary about 5 years ago when we moved into our farmhouse. I love the idea of hanging the wreath from the center. Adorable. Wish I could fit it into my bedroom - mine is in the living room. Looks nice there, though. Love all these other pictures you've posted. Wonderful taste and lots of inspiration!